Yamaguchi Takeo was a pioneer of Japanese modern abstract painting, who matured at the same time that Art Informel became so influential in Japan, yet he remained independent from it. Born in Seoul, Korea, he studied Western painting at the Tokyo Art School and was particularly influenced by Cubism, which reduced painting to a flat, monochromatic expanse. After graduating he went to Paris and studied avant-garde European painting. 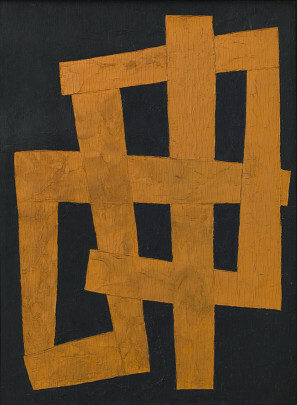 In 1938, he joined with fellow abstract artists Saito Yoshishige, Yoshihara Jiro, and Hasegawa Saburo to found the avant-garde group Ninth Room Association (Kyushitsu-kai). After the war and by the mid-late 1950s his style had matured. 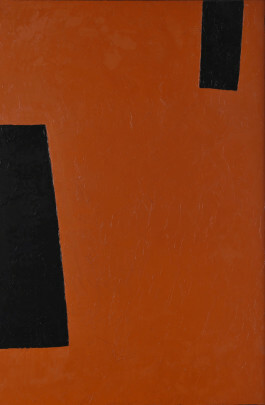 He applied dense layers of paint to wood boards, carefully smoothed with a palette knife, forming clearly-defined rectangular forms often in rich red or yellow ochre, sometimes against a black background.